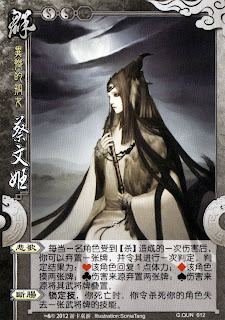 "The Lone Dame in Foreign Lands 异乡的孤女 (yì xiāng dè gū nǚ)"
Like a scene out of a Chinese horror movie, a lone damsel sits in the night out in the woods, strumming an ancient Chinese string instrument. Her long straight hair gently swaying along with the willows, her sharp face pale, white and mournful. Who is Lady Cai? What is her role in the story? Truth be told, the name Cai Wen Ji was complete new to me when I heard about this character in the Hills Pack. As it turns out, she was a very minor character, a musician and poet, but with a sad life story. Married at the age of 15 but widowed soon after, she was then held captive by the Xiong Nu 匈奴 clan chieftain for many years. He then made her his wife and she bore him children, but her heart had always yearned for home. It would be 12 years later before a particular famous warlord ransomed her... but only to fulfill his own agenda. This warlord would go on to become one of the most famous person throughout Chinese history. Who was this warlord? Read on the find out! Character ability 1: "Dirge 悲歌 (bēi gē)"
Hearts: the victim regains 1 unit of health. Diamonds: the victim draws two cards. Clubs: the attacker discards two cards. Spades: the attacker stacks his/her character cards. When you die, you cause the player who kills you to lose all the abilities of one of his/her character cards. “Sorrow” has been changed such that the killer only loses the abilities on one of his/her character card. The ability mechanics do not have a direct link to the story, but the names of the abilities do. Both "Dirge" and "Sorrow" relates to the life of Lady Cai. After being imprisoned by the Xiongnu nomads, she composed a series of famous musical pieces known as the "Eighteen Songs of a Nomad Flute 胡笳十八拍". Later in her life, she wrote some poems with a sorrowful tone, lamenting her turbulent life. See? What did I tell you? The perfect character for a sorrowful female apparition! What on earth is stack character cards??? Stack character cards mean skip one turn / flip your character. If I take dmg from attack, can I use Dirge on myself?